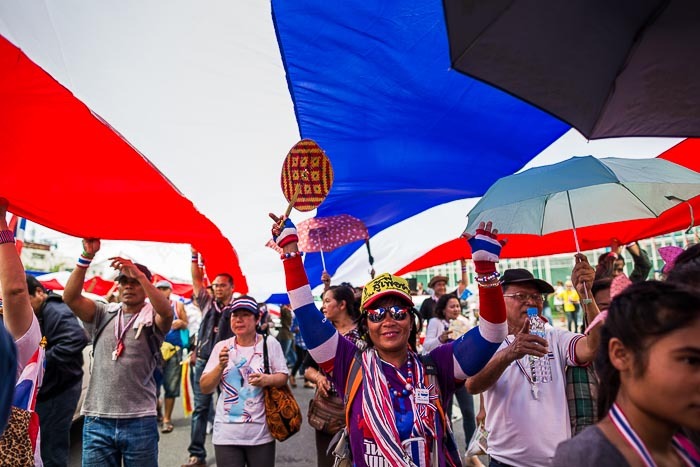 Anti-government protestors carry a large Thai flag down Ratchadamnoen Ave in Bangkok Friday. 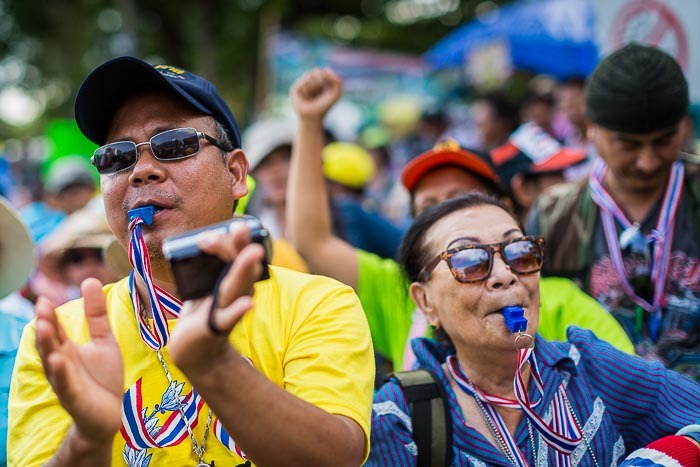 Suthep and the PDRC are back in the street after more than a month of relative calm. 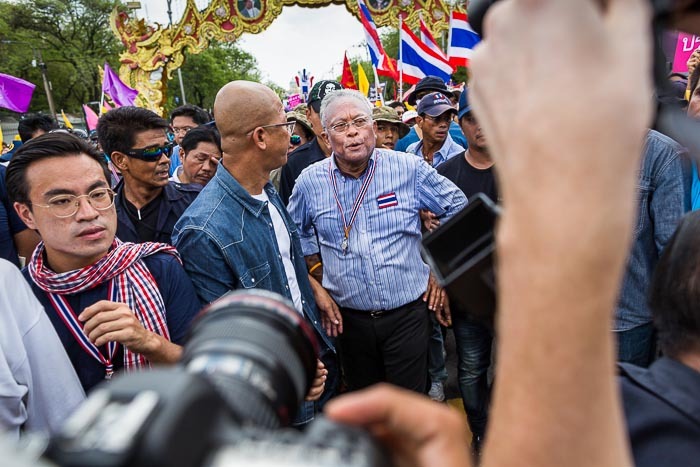 Suthep ended "Shutdown Bangkok" a little over a month ago and most of the protestors aligned with him decamped to Lumpini Park. They've essentially shutdown the park but most of the rest of the city has been open. That changed Friday when Suthep and his followers launched their "Final Push" to bring down the government. The Bangkok Post guesstimates that this is Suthep's 11th "final push" or "final battle". It's a term he likes to use. The previous 10 pushes ended with protestors moving back to their camps and the Prime Minister running the country. Suthep works the crowd on his latest "final push." The dynamic is a little different this time though. For one thing, Yingluck Shinawatra's time as Prime Minister is finished. For real. Her tenure wasn't ended by Suthep or the PDRC, rather it was the Thai courts that ended her Premiership. First the Constitutional Court ruled that personnel moves she made in 2011, early in her tenure, violated the Constitution and promoted a family member improperly. They kicked her and nine of her cabinet ministers out of office. The very next day the country Anti-Corruption Commission indicted her alleged improprieties related to Thailand's rice pledging scheme. The NACC called for her impeachment. This is really the nail in her political coffin. The court ruling, at this point, doesn't bar from her running again (and since the Pheu Thai still commands an electoral lead she could win) but impeachment would bar her from participating in politics for five years. People cheer the Prime Minister's (now ex-Prime Minister) ouster during a rally in Lumpini Park. Those events prompted Suthep to launch his 11th "final push." Friday, thousands of PDRC supporters marched through Bangkok, blockading TV stations and government offices. Suthep has called on the Senate (the only functioning elected body in Thailand right now) to appoint an interim Prime Minister he approves of or he will appoint one himself. In the meantime, the Red Shirts, who support the government and have stayed largely silent through the protests, are coming to Bangkok to rally and show support for the government (or former government). I think Thailand is entering a new phase in this stand off and I have no idea how or when it's going to end. 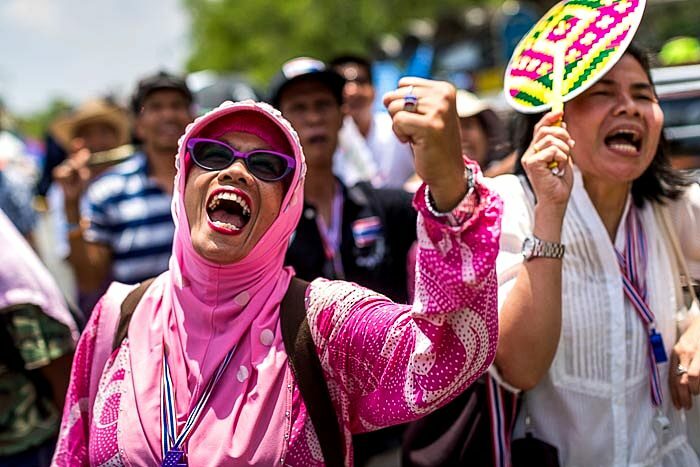 A woman cheers for Suthep in front of Government House Friday. There are more photos of Friday's "Final Push" and Shutdown Bangkok that preceded it in my archive or from ZUMA Press.